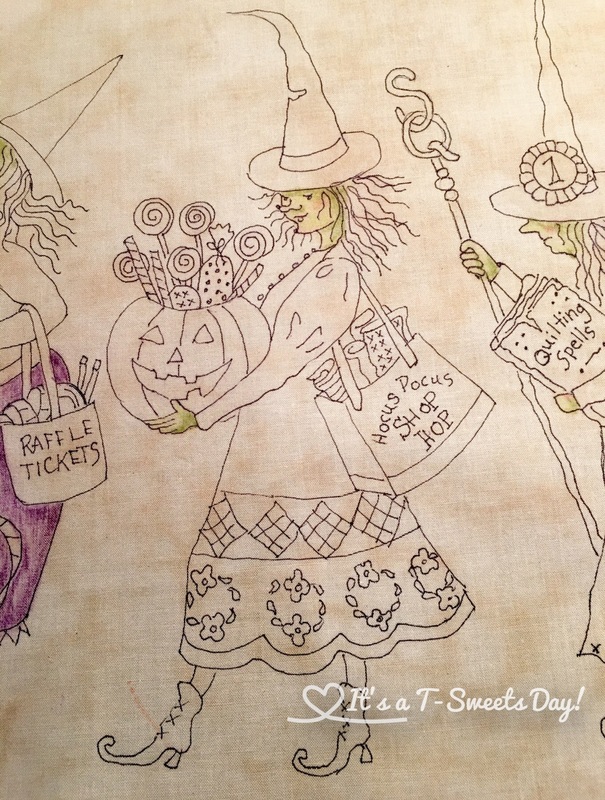 Salem Quilt Guild #1 – It's a T-Sweets day! Published on August 12, 2016 August 12, 2016 by Tracy @ It's a T-Sweets Day! A few years back at the Buggy Barn quilt show I saw a way super fun Crabapple Hill Studio quilt that looked so amazing that I never dreamed I would be able to do anything like it. But since I have been trying my hand at embroidery with the Splendid Sampler, I decided to try the Mystery of the Salem Quilt Guild pattern on the Crabapple Hill website. I ordered all of the panels and the finishing kit. I traced, colored and heat set the fabric. I used a large window and taped the pattern and fabric down to get it traced accurately. I organized all of my threads and started embroidering. It is like a permanent fabric adult coloring book with thread. FUN!! I just can’t say how much I am enjoying this project. I am excited to start panel #2 of 3. Your skill as a painter is coming through loud and clear. Beautiful shading, and the embroidery puts an exclamation point on the design. I can envision this application on some tea towels. I’m assuming it is colorfast, or would a kitchen use be too much wear? Your thoughts? This is wonderful. I love all of the color and detail! Great job. Cute, cute, cute! What brand of pens did you use to color the fabric? Thus looks great! Oh my!! That’s pretty much the best of all worlds! 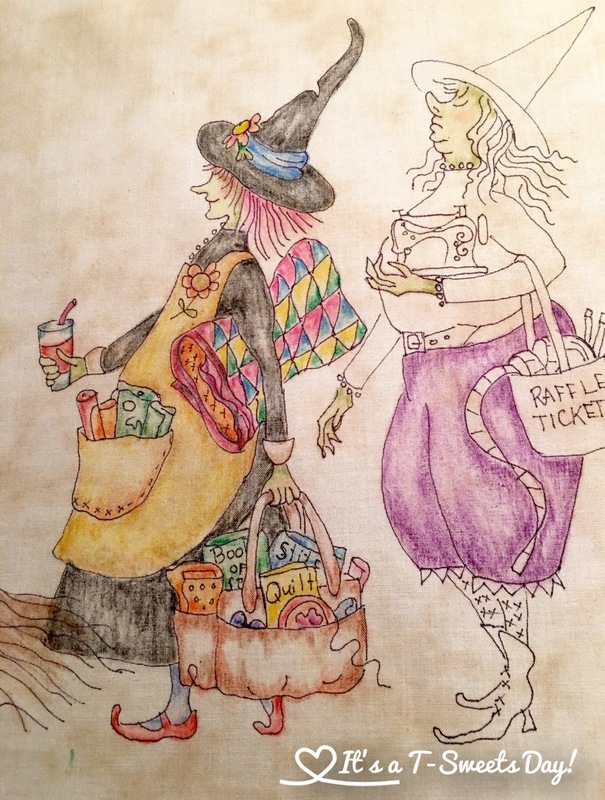 Coloring, embroidery, quilting. So cute!!! What an amazing idea! It really is just redwork stitching, but the final effect is just marvellous! May I ask what you use to colour with? I am not a quilter, I am an embroideress, and I am not up on the newer techniques like this, but I think I can feel a new craft coming on! Hello Baba String Things!– A new craft is definitely in the future:). It is so fun! This really is simple. I colored everything with a white base to begin and then colored over the top with the colors. The crayons were the ordinary crayola crayons used by my children. I bought a new 64 count box just for me. When I opened them up I felt like a child again as I smelled that wax aroma and looked at the pretty colors just waiting to be held and colored with. Really, it was so fun. I hope you try it. You will LOVE it! I love this. I like to do stitching but never considered this before. I have tons of coloring books that I make stitching designs from. Thank you, I now have something else I can do when not sitting in front of the sewing machine! I saw this kit at the AQS show last week. I love all things Halloween and was totally tempted to buy the whole kit and kaboodle. Thoughts of my stacks of unfinished projects and my general ‘too cheap-ness’ kept me from getting it, but it still looks totally awesome. I may end up with it yet!!! I know what you mean by stacks of projects! But you could totally amp this one up with all of your bead work:)! I am jealous even thinking about it! Lol! You may be tempting me tooooo much! 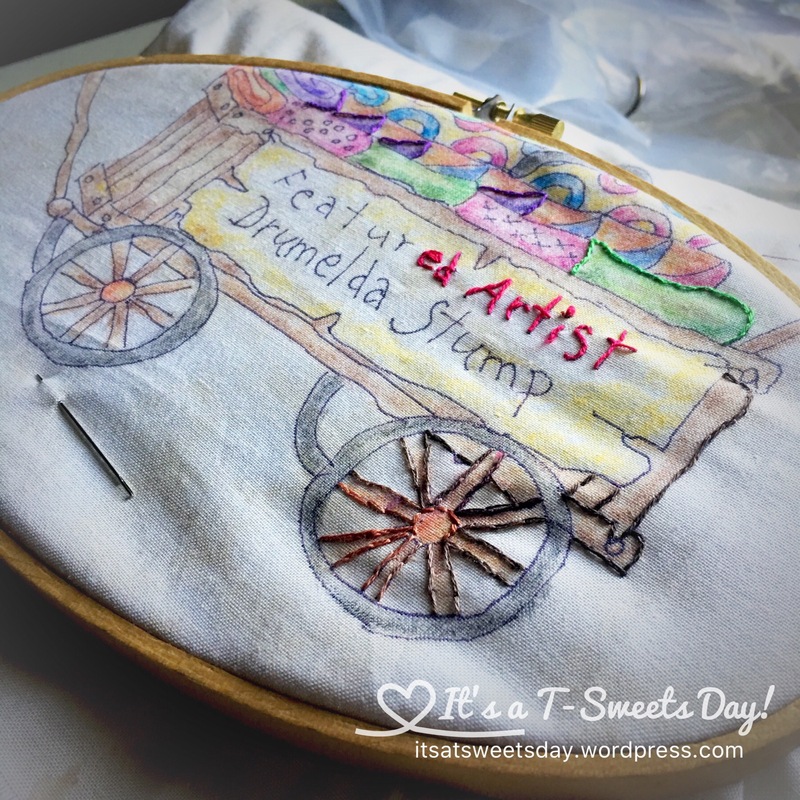 Pingback: Embroidering my Splendid Sampler – It's a T-Sweets day! 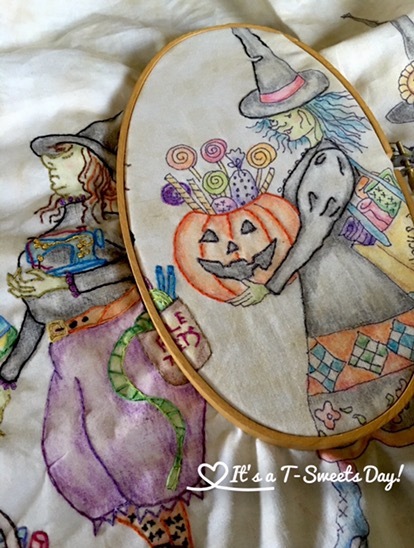 Pingback: Splendidly Sewing – It's a T-Sweets day!